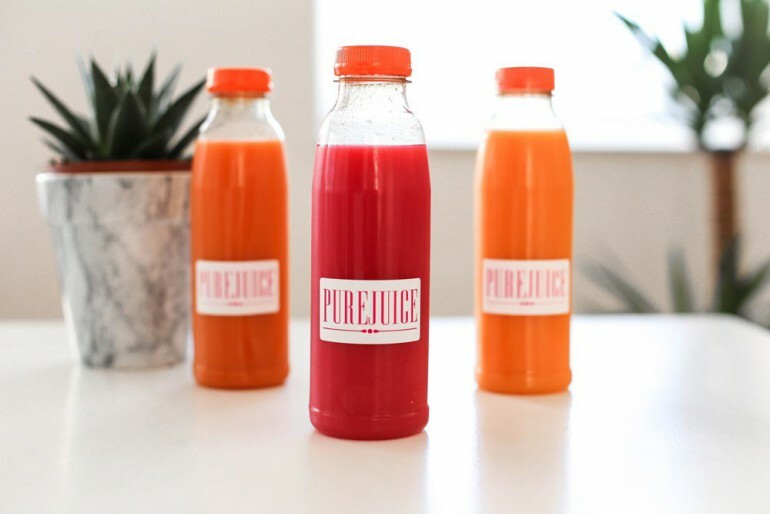 Almost one week ago I started a 3-day-detox with Pure Juice. Since my last trial turned out to be a major failure (damn you French fries), I was really focussed on doing a good job and making myself proud. The advantage now was that I was allowed to eat a few healthy things like salads and fruits (I do enjoy chewing) in between juices. Practicing heavy sports was discouraged but since I’m rather a couch instead of a sporty spice that wasn’t a problem at all. Only thing I really shuddered from was replacing coffee by green tea and avoiding sugar. To remember this wonderful experience afterwards I wrote everything down in a ‘diary’ during this 3-day-detox. Ready to discover my juicy journey? Tuesday January 12th 2016 This morning I went to pick up my Pure Juice package and by the time I got back home I was already hungry :-/ To avoid a breakdown I immediately started with juice n°1 which had a rather bitter taste (thanks to the grapefruit) but I felt better after drinking it. Every 2/3 hours I had another one and in the meanwhile I ate some raw vegetables to fill up my very angry stomach. Luckily the 3 other juices were really delicious which prevented me from having a sugar waffle. Now it’s around 8 p.m. and I’m about to eat my soup. Since I managed to avoid coffee and sugar all day (high five to myself) I’m heaving a major headache and my energy level is rather low. This means no going out for me tonight but the couch and Netflix instead. Wednesday January 13th 2016 I woke up being really hungry so I had oat flakes with almond milk together with my first juice this morning. Doing a detox really sounded easier than it actually is and I now remember why I ate those fries last time. When you can stay at home, when you’re behind a desk all day or during summer I think it would be a whole lot easier to keep going without actually eating. But today it’s cold, raining and I have to go outside for meetings and to take pictures for the blog so I hope my energy level won’t let me down. Day 2 is almost over and even though I was a bit down in the morning it went a whole lot better than yesterday. I ate a few grilled vegetables with my soup tho, if I can’t chew on something I keep on thinking about food and this makes it too difficult to stay focussed on my work. And I secretly had a coffee this afternoon which totally wasn’t allowed but tasted so damn good. Thursday January 14th 2016 My third and last detox day… even juice n°1 tasted good this morning. Since I was helping out at the LN Knits store I put everything in the on-the-go cool box Marieke from Pure Juice gave me (very practical btw). It’s funny that in the beginning (sounds a bit weird since it has only been 3 days) I had a hard time and now things are going quite smoothly. I even realized this afternoon that I’m going to miss drinking the juices even though I really look forward to eat some ‘normal’ food again. This evening I ate my last soup together with a dish of green beans and I’m full of energy so I guess that’s a good thing (even managed to clean my apartment). I’m actually thinking about doing the detox again within a few months and without any form of cheating! Visit the Pure Juice website for more information.